Cowboy boot made in bone and black cow leather. This mid calf model with contrast stitching has subtile studs at the foot and in the shaft. Is easy to combine and has a feminine look. Read more..
studs in mat metal. This boot has a bit of a retro feel, but it fits perfect in today's fashion! This boot has a Snip Toe, a trademark of a true western boot. The boot is lined with turquoise leather, the signature of this line of Corral boots. The classic heel of the boot is a typical Cowboy Heel. With these boots, you'll get a bottle of Saphir maintenance product worth €15,- as a gift. No problem, you can order this boot here! Net binnen gekregen, meteen gaan passen en flink voor gevallen! Binnen 24 uur had ik ze aan mijn voeten. Love them! Stoer, mooie laars, mooie afwerking (ook aan de binnenkant), goed sluitend aan de voet. Love them! Of had ik dat al gezegd? 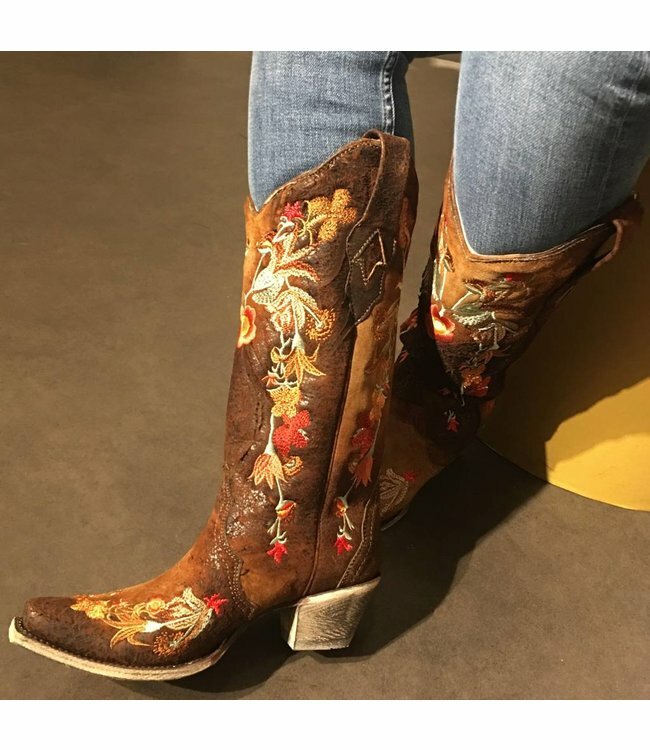 Brown leather cowboy boot with floral embroidery by Corral B..